Help your third grader get the most out of what they read with these reading comprehension worksheets designed for struggling readers and bookworms alike. At this stage in the game, texts are getting a little longer and more complex, and these worksheets will instill the skillsets necessary for your child to understand and enjoy their reading, such as story sequencing, summarizing, comparing and contrasting, and more! 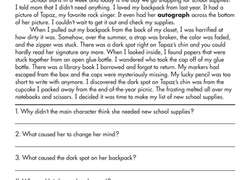 Use this short story and T-chart to teach students how to recognise cause and effect relationships in fiction. Read this fable and answer questions to practise reading comprehension.